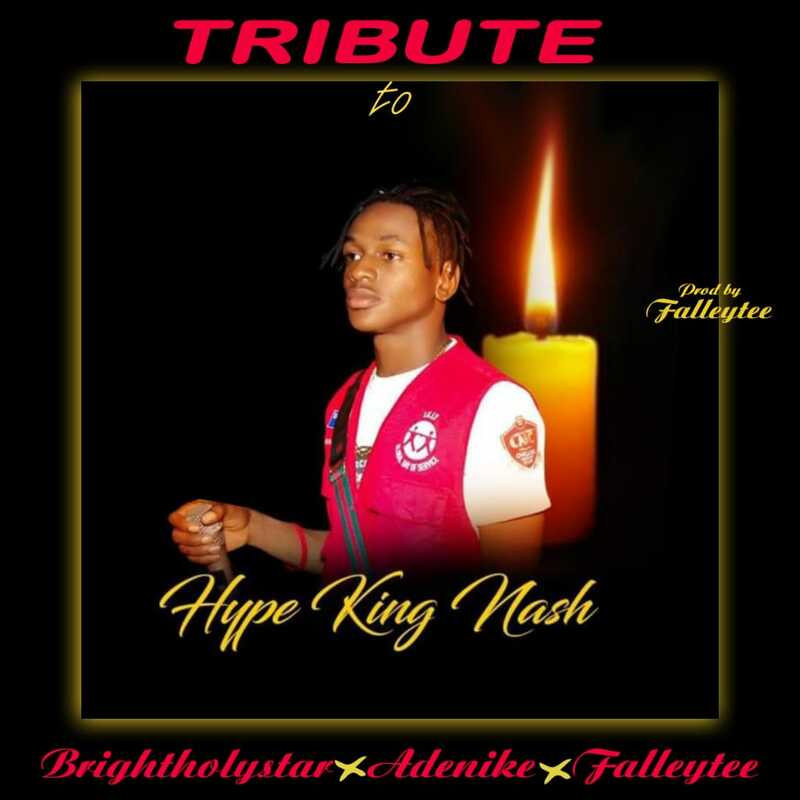 The death of Hypeman Nash came as a shock to everyone expecially Ondo State Music Industry which made Brightholystar, Adenike and Falleytee to jump on a Tribute song. I just want to mention I am newbie to weblog and certainly enjoyed you’re web page. Probably I’m going to bookmark your website . You really come with perfect article content. Thanks a lot for revealing your webpage. A powerful share, I just given this onto a colleague who was doing somewhat evaluation on this. And he in actual fact purchased me breakfast as a result of I found it for him.. smile. So let me reword that: Thnx for the deal with! However yeah Thnkx for spending the time to discuss this, I really feel strongly about it and love studying more on this topic. If possible, as you become experience, would you thoughts updating your blog with more details? It’s highly helpful for me. Huge thumb up for this blog put up! I would like to show my appreciation to the writer for rescuing me from this type of crisis. Right after exploring through the world wide web and obtaining proposals that were not helpful, I was thinking my life was well over. Existing devoid of the answers to the difficulties you’ve sorted out all through your post is a critical case, as well as those which might have negatively damaged my entire career if I had not discovered your site. Your personal ability and kindness in controlling the whole lot was tremendous. I don’t know what I would have done if I hadn’t come across such a thing like this. I am able to now look forward to my future. Thanks very much for this high quality and amazing help. I won’t be reluctant to refer the blog to anyone who needs tips on this area. I do consider all the ideas you have offered for your post. They’re very convincing and can definitely work. Still, the posts are too brief for newbies. Could you please prolong them a bit from next time? Thanks for the post. Great post. I was checking constantly this blog and I am impressed! Extremely useful info particularly the last part 🙂 I care for such info a lot. I was looking for this certain info for a long time. Thank you and best of luck. Thank you a lot for sharing this with all of us you really realize what you are speaking about! Bookmarked. Please also visit my site =). We can have a link alternate contract between us! ilhnauuvpl,If you are going for best contents like I do, just go to see this web page daily because it offers quality contents, thanks! ccikzxyfjv,Some really nice stuff on this website, I enjoy it. Great ¡V I should definitely pronounce, impressed with your web site. I had no trouble navigating through all tabs as well as related info ended up being truly easy to do to access. I recently found what I hoped for before you know it at all. Quite unusual. Is likely to appreciate it for those who add forums or something, website theme . a tones way for your customer to communicate. Nice task..
roicfggnpnc,This website truly has alll of the information and facts I wanted about this subject and didn?t know who to ask. naturally like your web-site however you need to take a look at the spelling on several of your posts. Many of them are rife with spelling issues and I in finding it very bothersome to tell the reality on the other hand I¡¦ll surely come back again. Great post. I was checking constantly this blog and I am impressed! Very useful info specially the last part 🙂 I care for such info much. I was looking for this particular information for a very long time. Thank you and good luck. cqvdjrm,Wonderful one thank you so much ! I¡¦ve read several just right stuff here. Certainly worth bookmarking for revisiting. I surprise how a lot effort you place to create this kind of magnificent informative web site. Great post. I was checking constantly this blog and I’m impressed! Very useful information particularly the last part 🙂 I care for such info much. I was looking for this particular information for a long time. Thank you and good luck. Hi, Neat post. There is a problem with your site in internet explorer, might test this¡K IE nonetheless is the market leader and a large component of other folks will leave out your magnificent writing due to this problem. My husband and i ended up being now fortunate when Chris managed to conclude his reports from your precious recommendations he got from your very own web pages. It is now and again perplexing to just possibly be freely giving steps which usually many others could have been selling. We understand we have you to be grateful to for this. The entire illustrations you have made, the simple web site menu, the friendships your site give support to create – it is all awesome, and it is letting our son and us consider that that issue is thrilling, which is certainly unbelievably mandatory. Thanks for everything! obviously like your website however you have to test the spelling on quite a few of your posts. Many of them are rife with spelling problems and I in finding it very bothersome to tell the reality then again I will certainly come back again. I have been exploring for a little for any high quality articles or blog posts in this kind of area . Exploring in Yahoo I finally stumbled upon this website. Studying this info So i am happy to express that I’ve a very good uncanny feeling I found out exactly what I needed. I such a lot certainly will make sure to don¡¦t forget this website and provides it a glance regularly. I was just searching for this info for a while. After six hours of continuous Googleing, at last I got it in your web site. I wonder what’s the lack of Google strategy that don’t rank this type of informative sites in top of the list. Normally the top sites are full of garbage. Hello there, You’ve done a great job. I will certainly digg it and personally suggest to my friends. I’m confident they’ll be benefited from this web site. Hiya very nice web site!! Guy .. Excellent .. Superb .. I’ll bookmark your website and take the feeds also¡KI’m happy to seek out a lot of useful info here in the put up, we want develop more strategies in this regard, thank you for sharing. . . . . . Helpful information. Fortunate me I discovered your web site accidentally, and I am stunned why this twist of fate did not came about in advance! I bookmarked it. It is in point of fact a nice and useful piece of information. I am glad that you just shared this helpful info with us. Please stay us informed like this. Thank you for sharing. There is apparently a lot to identify about this. I consider you made various good points in features also. Hi my friend! I want to say that this article is amazing, nice written and come with approximately all important infos. I would like to peer extra posts like this . Hello there, I found your site via Google at the same time as searching for a similar topic, your web site got here up, it looks great. I’ve bookmarked it in my google bookmarks. I simply want to tell you that I am all new to blogging and honestly savored you’re web blog. Most likely I’m want to bookmark your site . You absolutely have tremendous articles. Many thanks for sharing with us your web page. hey there and thank you for your info – I have definitely picked up something new from right here. I did however expertise some technical issues using this web site, as I experienced to reload the site lots of times previous to I could get it to load properly. I had been wondering if your web host is OK? Not that I’m complaining, but sluggish loading instances times will sometimes affect your placement in google and could damage your high-quality score if ads and marketing with Adwords. Well I am adding this RSS to my email and could look out for a lot more of your respective exciting content. Make sure you update this again very soon.. Someone necessarily assist to make significantly articles I might state. That is the first time I frequented your website page and so far? I surprised with the analysis you made to create this particular publish amazing. Excellent job! Just how could I write blog sites or write-ups as well as earn money for it? Fantastic goods from you, man. I have understand your stuff previous to and you’re just too wonderful. I actually like what you have acquired here, really like what you are saying and the way in which you say it. You make it enjoyable and you still care for to keep it smart. I can not wait to read far more from you. This is really a terrific web site. I do trust all the ideas you have presented for your post. They are really convincing and can certainly work. Nonetheless, the posts are too brief for newbies. May just you please lengthen them a little from subsequent time? Thanks for the post. GRz230 Wow, incredible blog structure! How long have you been running a blog for? you make running a blog glance easy. The total look of your web site is magnificent, let alone the content material! whoah this weblog is magnificent i love reading your articles. Stay up the great work! You understand, a lot of persons are searching around for this information, you can help them greatly.